The inspiring true story of Lopez Lomong, a Sudanese lost boy who achieved his dream of becoming an American citizen and Olympic athlete. He was abducted. He was beaten. And he was nearly forced to become a boy solider in his war-torn homeland, Sudan. But he escaped in the night, ran three days, and was taken into a refugee camp in Kenya. He never owned a pair of shoes. He never owned a pen or paper and did schoolwork in the dust with his fingertips. His boyhood was the daily struggle of an orphan, and each day he would run an eighteen-mile lap around the refugee camp just to play a game of soccer. In his wildest dreams, Lopez Lomong couldnt even conceive that Nike would one day be his official sponsor, that he would graduate from college, and that he would represent his new home and bear the American flag in the Summer Olympics. 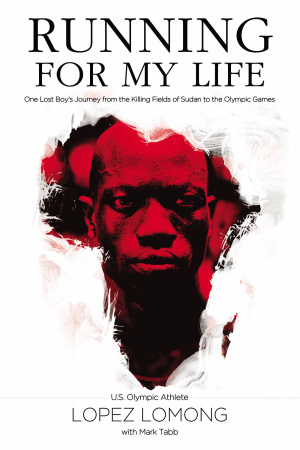 'Running for My Life' is Lopez Lomongs harrowing story of loss, overcoming, triumph and redemption. It is the once-in-a-lifetime story of a Sudanese lost boy who became an American citizen and Olympic athlete. His life is a powerful picture of the fact that we can overcome, that what seems out of reach is within our grasp if wed believe and if wed only try. A story of faith, and a story that captures the best of humanity, Running for My Life will arrest the hearts and inspire the hopes of readers everywhere. Running For My Life by Lopez Lomong was published by Thomas Nelson in June 2012 and is our 16029th best seller. The ISBN for Running For My Life is 9781400275038. I’d like to start by saying I really wasn’t that interested in reading this book and didn’t think I’d enjoy it much – boy was I wrong and am I glad that I was sent this book to review. It’s a well written first person voiced autobiography of someone I knew nothing about, US Olympic athlete, Lopez Lomong, that said though this is not a typical sports biography, in fact really it isn’t a sports biography though sport factors strongly in it. Instead it is the gut wrenching story of a small 6 year old, violently stolen from his family to be a boy soldier, who through the grace and bravery of some other stolen children escaped and ran and ran and ran to what he thought would be his mother but was actually Kenya and a refugee camp. It’s a story of loss and wonder and small miracles and above all faith in adversity. It’s also the story of a journey to America, of a time of change and transition, of having one passion and realising that though that may be what we love it’s not always what we are best called to and sometimes we have to change focus to be the best we can and what we are called to be – and this through the medium of an enduring love of soccer transformed to the wonder of running, something that Lopez certainly knew all about. It’s an incredible witness testimony and one certainly worth reading, especially if you want a story full of faith, triumph and real commitment with an insight into the horrors of Sudan and child victims of war, but above all with the focus on the fact that nothing is impossible with God. Got a question? No problem! Just click here to ask us about Running For My Life.